If you’re not familiar with the Bont shoe fitting system you’re in for a treat. 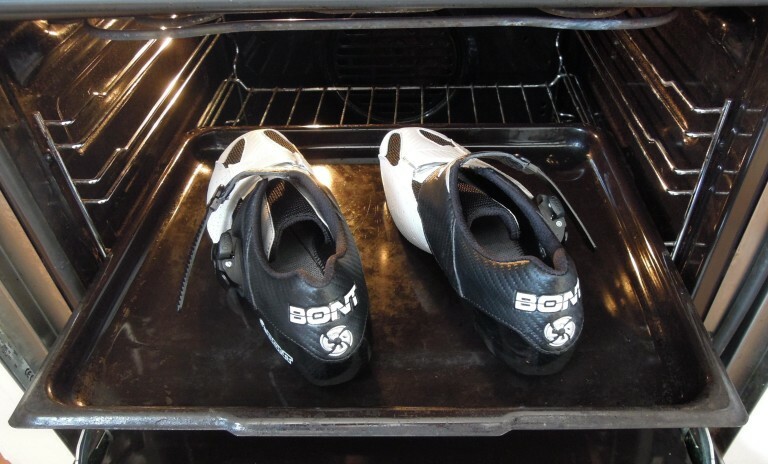 The main feature of Bont shoes is the ability to custom fit them by heat moulding the sole. The real beauty is that this can be done at home with an oven as many times as you like until you get the fit you want. Simply put the shoes in a pre heated oven set the timer and that’s it. When the shoes come out put them on and the soles will simply mould to your feet. If you need to adjust the outside of the soles ie heels or arches, then this can be done with delicate pressure and doesn’t distort the structural integrity of the sole either. 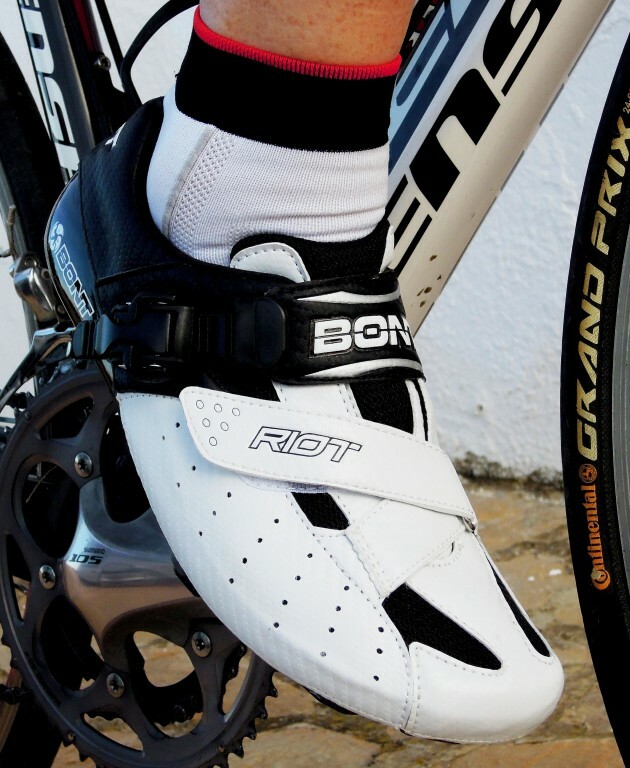 What is especially outstanding about the Bont Riot shoes is that all this technology is available for under £100. The shoe has a carbon composite sole which has carbon placed between layers of fibreglass to strengthen the shoe and keep weight down. The microfiber upper is supple but hardwearing with small holes along both sides of the front of the shoe and several mesh panels to aid breathability. The tongue is a mix of microfiber and mesh with a small amount of padding. Fastening is taken care of by an adjustable ratchet buckle at the rear of the top of the foot and a Velcro Z strap at the front. One of the main differences with Bont shoes is that the sole is actually shaped like a bathtub with the sole extending upwards at the sides wrapping the forefoot by approx 1cm at the front gradually moving to 3cm at the heel. This stops the sole of the foot from moving around with the upper keeping it place almost like a lid as opposed to traditional shoes with a flat sole and upper wrapping round the lower foot at the show sole. This may sound odd but boy does it work. This shoe is all about the sole and the customisation it offers. Trying it on for the first time you immediately notice the bathtub shape and stiffness of the sole but mainly how comfortable they are. Straight out of the box they feel comfy and I know of a few riders, including one professional, who haven’t moulded the shoes as they haven’t felt the need to. When you do mould them though (don’t mix up your Celsius and Fahrenheit here) they feel even better. It took me three attempts, 20 minutes at 70C/160F, to get the fit I wanted as the front of the shoe needed a bit of work but this time spent is well justified as I haven’t had a problem since. Bet you’ve never been so attentive to heating instructions before! Despite the relatively thin sole, Bont claim 4.8mm, they don’t feel harsh when on the bike and I haven’t felt the cleat screws like I can with some thin sole shoes. The longitudinal arch support does a great job of taking pressure of the forefoot without feeling too big or bulky and adds to the slipper like feel. As the sole isn’t full carbon fibre it isn’t as rigid as my other more expensive Bont shoes but is a lot stiffer than shoes I have from other manufacturers costing more than twice the price of these. This also means they are slightly heavier than my other Bonts but again lighter than other more expensive shoes, we are taking grams here and the comfort factor more outweighs the slight weight penalty for me. The ratchet fastening system keeps the shoe firmly in place at the rear and the Z strap across the front and I haven’t experienced any pressure build up from either. Although saying that I feel if the Z strap was fastened towards the front rather than the rear it would probably be better but this is only a personal niggle. I was initially concerned about the lack of venting in the shoe but after several days riding in sunny Spain, there was no real difference between these and my lightweight summer shoes and in fact these became my go to shoe even on the hottest days. Overall finish is very good and the simple black and white colourscheme also ensured it went with all colours of kit and socks. Be careful though as there are no rubber toe bumpers on the front so they can be easily scuffed if you’re not attentive. The other point about Bont shoes is the sizing. I have wide fitting feet and on these models I went for the standard fitting size 43 and they are practically the same size as my standard size 43 Shimano shoes. Those with smaller feet would probably be better going for the narrow fitting e.g. if you are used to the likes of Sidi. 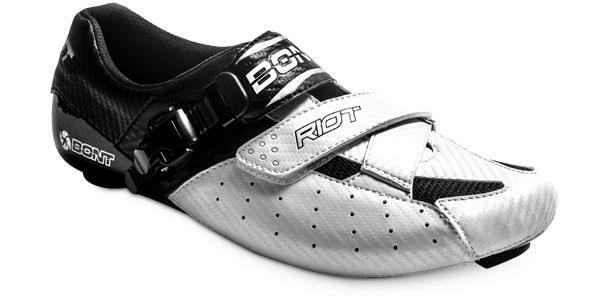 Best bet if you can’t try them on is to use the handy sizing guide specifically for the Riot show on the Bont website as this seems to be the most accurate way of determining sizes. If you want a fully custom moldable shoe that’s efficient and super comfy and don’t want to break the bank. 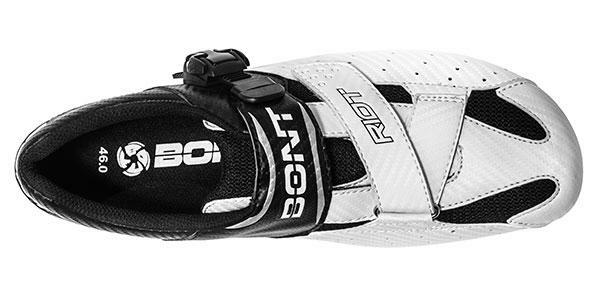 In fact we can’t think of a better fitting or stiffer shoe at this price point, Bont really have set the bar high for entry level race shoes with the Riot. 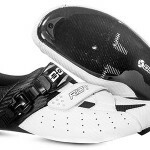 Tagged bont, clipless, mouldable, oven ready shoes, review, riot, shoes. Bookmark the permalink.